The Summary tab is where the foundation of a class is built. This page is where important settings for a class are created, and it is from this page that search criteria are pulled in class reporting and searching. The Summary page allows the user to customize the class name, location, status, day(s) of class, tuition fee(s), description, session, room, category 1, 2, and 3, gender, minimum / maximum ages, maximum class size, maximum wait list size, registration start date, class start / end dates, class start / end times, class duration. Options are offered for whether the class is available for display on your website class listings tables, whether you allow web registration, portal enrollment, and/or trial enrollment. Attendance or Absences are recorded for a class from this tab. See Track Absences or Attendance for more details. Makeups are recorded on this tab. Refer to the Makeup Classes Help section for more information. Instructors are assigned to a class from the Instructor tab. Jackrabbit allows up to four instructors for each class. Refer to the Staff / Instructors Help section including the Assign Staff / Instructors to Classes article for complete details. 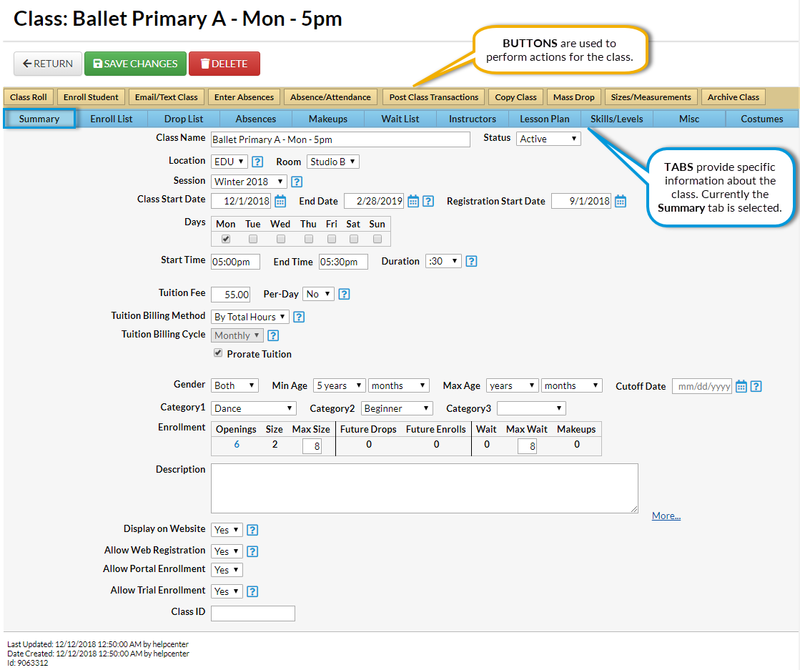 The Lesson Plan tab allows a user to enter class lesson plan information. Click the Add Lesson Plan button to add lesson plans to the class. If you have created Master Lesson Plans (using Classes > Master Lesson Plans), you can copy them into a class using the Copy Master Lesson Plan button. See Create a Master Lesson Plan for more information. This tab allows the user to add either apparel, costumes, equipment, materials, or supplies to a class. The name of this tab is dependent on the setting chosen in Tools > Edit Settings > Costume/Apparel Module Settings > Preferred Costume Module Name. See the Costumes / Apparel Management Help section for more detail. In addition to enrolling a student from the Family page or the Student page, it is also possible to enroll students using the Enroll Students button from the Class page. Refer to the Enroll Students into Classes Help section for more detail. Use this button to enter absences or attendance. Refer to the Student Absences / Attendance Help section for more detail. The Absence/Attendance button provides a shortcut to the Student Attendance Report for that class. See Student Attendance Report for complete details. Jackrabbit offers many options for posting fees, including using the button to post a group fee to a specific class. See Post Class Transactions for additional details. Mass Drop is a quick, efficient way to drop all the students from a class. It is recommended when a class is cancelled. If a class is over (completed), we recommend you use Archive Classes. Enter sizes / measurements for students in a class using this button. Refer to the Costumes / Apparel Management Help section for additional details.